Today I want to share about Carter – the following Eulogy was shared at his funeral. Please excuse the ramblings and copyright infringements. For those of you who know our family well, you know that we are a tight-knit group…who happen to be a little competitive. We have a “Who’s the Smartest” contest that has been going on for years. We each take a turn at being the brilliant one. When Wade informed me that I was unanimously voted to give the Eulogy for Carter Joseph – pointing out that I still wasn’t the smartest – I was left speechless. This would be no small undertaking – share about this boy, this young man who as his mother put it “his soul was too big for this body.” How could I possibly do that? Even though I am rarely at a loss of words… I prayed to God to give me the words. I received these words from family and friends – from all of you really – and realized that I had found the words: …but just in case though – Big brother William has my back. Carter left this earth at the young age of 14, but he had lived and loved with a passion beyond his years. And everything will be just right. Carter would be rather upset to say it politely that we are all sad. As he told his mom over the past year and a half …and on his last day. “Will you stop crying, please? !” We know the clouds are here with us today, and there will be days like that, but we know the sunshine is somewhere up there, too. This is kind of perfect because his dad liked to call him sunshine. What can I say? The kid liked basketball with a passion. From his plethora of facts and critiques of the professionals to his love of the 3-point shot, this baller had a finesse on the court and in life. Carter was a bright light for us. He had a contagious smile and sense of humor we will never forget. His sense of shoe-style and team pride will not be lost. He is our team leader and goes before us. Jackson – has Carter’s signed basketball – he loved this game and we knew even at a young age he was given a gift from God… although Jackson reminded me that he tried to turn it into hockey – that just wasn’t his game and gift. Carter loved to practice and play – whether alone or with his teams. Tori –carries his Duke jersey and his signed poster from Duke’s Coach K. Carter had a love for Duke basketball that no one could deny. Not even Carolina-lovers, right Uncle Dustin? Although Carter didn’t get to live out his dreams fully –his reach made it to his dreams with the signed poster from Coach K and the signed ball from Stephen Curry. Jonah – carries Carter’s signed ball from Curry, wearing his jersey. Carter wasn’t able to Make-A-Wish, but Coach K and Steph Curry know of him and supported him. Jesse – represents Carter always being told “Stop bouncing that ball in the house.” Sorry about this part, Father Paul… Carter talked to God about this and got the ok.
Well today – we hope and pray he is bouncing the ball in His house. We are positive that Carter is keeping God busy with questions and ballin’ it up. 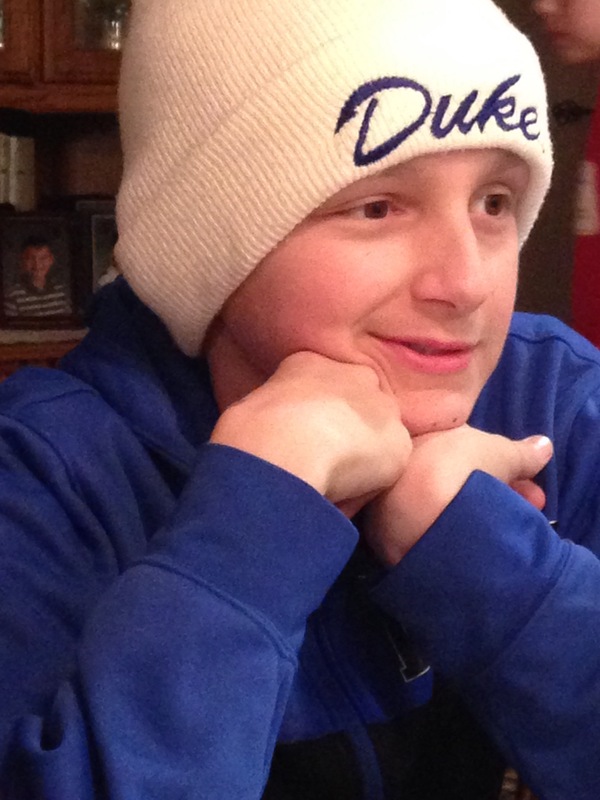 More than even basketball, Carter loved his family and friends. One of his all-time fav foods was Nana’s pancakes. Wyatt –carries forward the pancake bowl used to make so so so many batters of pancakes. Nana tried to get us to represent with a nice glass measuring bowl, but that is not what we knew growing up so it simply wouldn’t do. Sorry – Mom. Carter loved going to Grandma & Grandpa’s farm for breakfast, and it was whip-cream-with-a-cherry-on-top if there happen to be a pie and 4-wheelers involved…or driving along the countryside. Really this bowl represents so much more than food. It represents the love of family. Carter lived and loved his final vacation at the Geske lake-home with his whole family surrounding him with love, humor, and smiles. That is how we should remember his sunshine – how he would want to be remembered. Wyatt – also represents his love of family. He carries a fishing pole to represent Carter’s love of fishing and being with others. Again- this is really a social event for him… although he would want you to be quiet, he would want you there with him. This happens to be a sponge-bob fishing pole because he loved himself a good laugh. Marie– carries the Carter Strong sign to represent the outpouring of community support – support from friends – that Carter and the family have received this past year and a half. May our community and region really be an example for others of how to treat and support others. Without this support, this road would be so much tougher. Without a doubt, Carter was a fighter. He fought the good fight, and enjoyed his life. (Don’t get me wrong – he is like his dad through and through – he is really more of a lover with a soft spot for people.) Near the end when he was discussing the possibility of being accepted into a trial for treatment. He said to his mom “If I take a spot, that means that someone else will not have the chance.” What 14 year-old says that? He really cared for others. He enjoyed his time with family and friends – all of them. We are thankful for Sam, who kept him both in and out of trouble – we are thankful for that and the stories to share. He was a dear friend and with him his last day. We are also especially thankful for Maddy, who was able to remind him to just be and enjoy life’s moments. Maddy carries up pictures of their shared happiness. When asked what Carter said about living with cancer, her response was that they really didn’t talk about it. They would just be – living today. We are forever thankful that Maddy came into his life, and they knew that kind of love. Most 14 year-olds don’t have that – and she was an escape from pain, who made him smile and simply be. Even through the pain, he was strong and enjoyed life. I’m pretty sure even with grade inflation the rest of us would give that day a “F” for a grade. As scripture tells us, For everything there is a purpose… Let us learn from Carter’s story and share it with others so they, too, might be strong. Tiffany – carries his cross. Jesus tells us, I am the alpha and the omega. I am beginning and the end. We know that Jesus walked with Carter on his journey from the chubby baby to the young man. Carter held tight to his faith until the end. He may not have been shouting his faith from a hill, but his strength showed us his true faith. He often prayed Psalm 91 with his Mom and Katie – God our Protector. He had many conversations with God – getting to really know him. We can only imagine… Surrounded by His Glory…Carter took his faith with him as his guide home.